AlYoum is a Premium Responsive & Retina Display WordPress Theme perfect for Blogs / Magazines / Personal Blogs. The main advantage of this theme is fully customizable theme colors, with help theme options panel! Also, the content of the main page is a custom, and is formed using theme shortcodes. You can display an unlimited number of categories, and change the color of the categories, etc. You can also display video, audio and slider in posts! In the theme a lot of settings, with which you can easily customize the theme, as you need, also detailed documentation and quick support! WordPress theme for your Blog, Magazine or News website. NewsTrick can be configured to focus on your work, your blogging, or both. Algarida is A wordpress responsive theme for news websites and magazine, Algarida built with HTML CSS3, and Twitter Bootstrap with maximum features to build your wordpress news or magazine. Business+ is a premium multi-purpose responsive Magazine/Blog WordPress theme built with Html5/Css3. It is well suited to be a Magazine, Blog or a personal site. 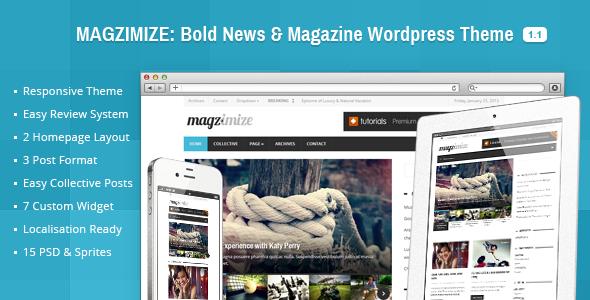 Magzimize – A Bold News and Magazine WordPress Theme, Great User Experience makes complexity being easy. Awesome usability and SEO optimized, suite for content lover and collecting great resource on the internet. 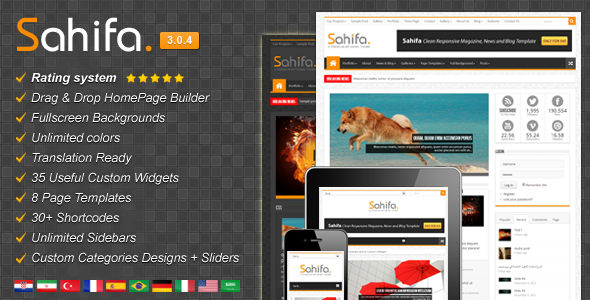 Sahifa is a Clean Responsive Magazine, News and Blog Template . 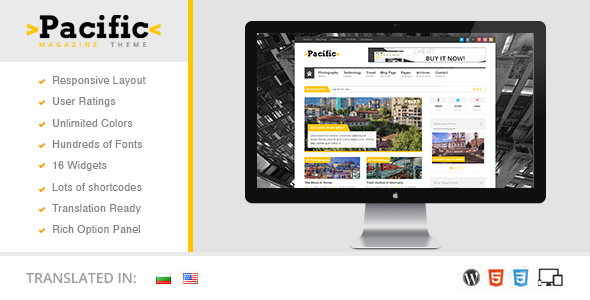 Pacific Magazine is a feature-rich all purpose theme with the responsive design. It features a very clean and elegant design. The theme is highly flexible, fully responsive and packed with awesome features. It is incredibly easy to use and ready to be up and running out of the box. Created using the latest HTML5 and CSS3 techniques. It comes with 5 custom widgets, 10 post formats and tons of theme options. 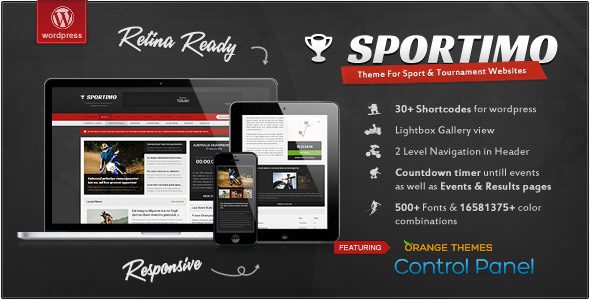 Sportimo has it’s own Bannery system, in which you can add images, text, videos or any other type of HTML code. You can add/edit all effects ( how often banners will show up, after how much seconds it will disappear, effects, fly in time e.c.). Blogbold is Responsive WordPress theme suite for blog, magazine and news web. This theme allow you to create blog, magazine and news with unlimited layout. With layout builder and module, create your own layout. This theme came with 1 default layout and 3 customize layout template for frontpage. You can easily to modify the templates, or create your own layout. Import the XML file, will make you easier to build your web. Developed base on Bootstrap with easy to use option panel and powerfull module system by shortcode, will make end user easier to develope their own web. RealBlog is a Responsive Masonry WordPress Blog Theme. Simplog is a stylish and pixel-perfect blog/magazine theme. Simple, refined design coded with the latest most effective techniques. It has been designed with mobile-first practices, ensuring a smooth flow of the layout in mobile devices. The theme is based on a 12 column 960 grid system and built with Twitter Bootstrap framework. Volcano can be configured to focus on your work, your blogging, or both. RapidNews is a feature-rich WordPress magazine theme. Great for magazine , review, news and blog sites, with integrated reviews, video, slideshows, galleries and ADS system in each post. RapidNews theme is highly configurable, you can completely configure the homepage and posts using the very easy and powerful theme options. Using 21 custom widgets you can create your homepage very quickly and you can get it just as you want it. RapidNews is responsive, so that it fits and looks great on different size of devices – desktop, mobile phones and tablets. Set up magazine home page is easy and quick – just customize widgets. FLYINGnews is a Retina-ready and fully responsive Magazine/Blog theme. It comes with a rich feature set to allow you to create your advanced and user friendly blog with a great attractive look. Like what you read here in this blog post? If yes, please sign up and get latest articles delivered to your email account for FREE! You’ll be also subscribed to newsletter, where I share a exclusive content and offers. Hi! I'm Kris. For a while I was blogging about WordPress, now I'm owner of HogStudio - Creative Agency focused on website development.